We thought long and hard about how we would attack Albania, bearing in mind that every time you entered a new port you needed a 50-70 euro agent to both check in and check out. Its indicative of how they are not set up for yachts, they treat us like all other shipping, hence the agent and the checking in and out. There is essentially no infrastructure for yachts in Albania so you need to be pretty self-sufficient and make sure you have plenty of fuel and water before you go. In the end we decided to go back to Orikum Marina where I briefly called into 3 years ago on the way down from Croatia. This broke up the journey north into manageable chunks and Orikum was the only marina in the whole country, so a good place to leave La Mischief whilst we headed off in a rental car for a couple of days. We left Corfu at 5am so we could get to our destination with plenty of daylight in hand. We however hadn’t factored in the disused minefields off the coast of Vlore that popped up on our charts. The charts advised to go around them and use the recommended path into the port. Not knowing any better (and not wanting to hit a mine) we took the charts advice and took the long way around. Luckily for us, we had a great southerly and with one reef in, we were chewing up the miles. We made it to Vlore around 4pm and the agent we had organized through Orikum Marina came and collected our passports and our 70 euros. Prices had gone up since we got there 3 years ago. Check in was quick and we motored down the 6nm to Orikum Marina against the strong southerly. Interesting suggestion – anchor in a minefield! Luigi was there to greet us again – he remembered us from last time. He organized a rental car for us – 40 euro a day. This was to be our strategy – moor La Mischief in Albania’s only real marina and drive up and down the country over a couple of days to see everything. Then an overnight sail to Bar in Montenegro. We had a little drama mooring up, as we had managed to get a plastic bag wrapped around our starboard prop. We managed enough power to drop our anchor and stern tie before I went over the side with a snorkel to clear it off the prop. Then it was off to a nearby fish restaurant that Luigi had recommended for a feed and a very nice bottle of Albanian wine. Amazing dinner. All at a very low price. Next morning we set off on our driving adventure. We decided to take the road from Orikum south through the national park towards Salande. The weather was overcast and quite soon we found ourselves driving in thick fog, rather than admiring the spectacular views that the National Park is renowned for. Eventually we reached the other coast and the fog was behind us. At one of the villages we picked up an old lady and took her 5kms along to where she wanted to be dropped off. Good deed done, we continued on and stopped at Palermos to take some photos of Ali Pasha’s castle. Then it was onto Salande, which is an interesting touristy town with many shops and restaurants. The weather was miserable so we didn’t stay long before we headed off to Butrint. 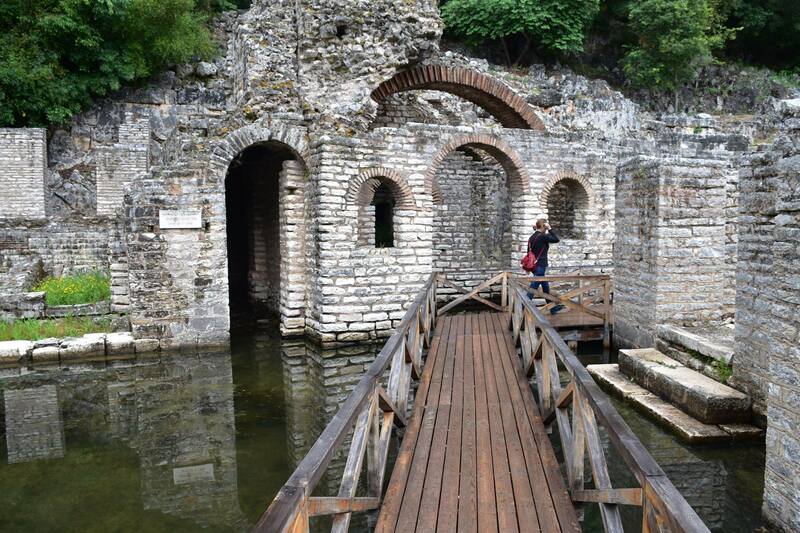 Butrint is a really nice set of Roman ruins in a lovely bush setting. It was really nice to wander around, especially since we scored a break in the rain. Then it was off to Blue Eye Spring. Driving in Albania requires concentration and a good ability to judge just how deep the next pot hole in the road actually is. Albanian Speed Bumps. Blue Eyes Spring is very pretty. And very interesting. The water just pours out of a hole in the flat ground. The colour of the water gives it the first part of its name, Blue, and the shape of the water as it comes vertically out of the ground gives it the second part of its name – Eyes. We had lunch at one of the cute restaurants that hung over the crystal clear river and pushed on to our final destination of the day – Gjirokaster, an old traditional Ottoman town. It was pretty to drive through on its steep narrow cobbled streets, but we were a bit pressed for time so we didn’t get out and walk around. Then it was back to Vlore to do some shopping – which was a bit challenging because even the larger supermarkets didn’t have a great deal. They were doing up Vlore’s foreshore with a bit of EU money and it looks like it will be good when its finished. They was a beer festival that had just finished – bummer – and lots of people, both young and old, out and about. Next day, we were off again. This time we would head east and north. First stop was Apollonia, with its old orthodox church, great museum and roman ruins. Then we checked out Berat, another wonderful Ottoman town. We drove up to the fort on the top of the hill and wandered around inside where the old town is situated. Great views and interesting architecture. Memories of Safronbula in Turkey. On the way to our final stop of the day in Durres, I got pulled over by the Constabulary and he informed me that I was speeding. Oops. Instead of a fine, I got told to be more careful and then he reached in and turned my headlights on for me. Thank you Mr Policeman. After my brush with the law, we proceeded (carefully) to Durres, where we checked out the Roman amphitheatre and old walls, followed by the tourist strip along the beach. We could see a couple of yachts in the harbour, but had been warned against going there because of all the crap that gets on your boats from the busy commercial harbour. No thanks! Then it was back to the Marina, after perusing what appeared to be the biggest supermarket, but finding not much at all. We returned the car, settled our bill (50 euro a night including power and undrinkable water) and ended up going back to the same restaurant again. It didn’t disappoint. We decided Albania was definitely worth a look. The people are super friendly and helpful, the scenery is amazing, the bunkers and fortification are strangely interesting, and food and wine is cheap. Albania comes with a really interesting history, country. It’s different to anywhere else we have been. The downsides are the lack of infrastructure (make sure you have plenty of water and fuel), the potholes in the roads, and the stupid idea that you need an agent to check you in to each port you visit at 50-70euros a pop. And not one single AK47. Our friends on Ooroo were way ahead of us on this score from when they visited 3 years ago. We exited Albania via re-visiting our agent in Vlore and then we were off overnight to Montenegro. After picking up our discount tax-free diesel, we continued our journey south towards Corfu. Our late start meant we would be out 2 nights, arriving in Corfu the morning of the third day. Leaving the Gulf, the winds were initially good and we looked set for a nice first night of sailing. There was no moon but otherwise we made steady progress through the night. The morning started okay as well,albeit the wind a little on the nose. Then it started to build and we started to have to tack our way south along the Albanian coast. By 3pm it was getting to resemble a washing machine as we reefed down and started to struggle to make head way. We were passing Vlore at the time and the weather looked a bit ominous so we made the call to go and have a look at Albania. The bay looked really protected and a lot more attractive than spending a night battling into a strong headwind, current and swell. So in we turned, straight over a disused minefield that the guide book said was okay provided you didn’t try and anchor. We didn’t try and anchor. Instead we headed for Vlore, where we could check into the country before we coud head to Albania’s one and only marina 7nm away. Now I’ve got to say that Vlore Harbour has seen better days. In fact, Albania has seen better days. Anthony informs us that 70% of Albanians recently lost their entire life savings through some pyramid selling scheme that scammed them. We finally got someone on the radio who told us to pull onto the crumbling jetty between the ferry from Bari and a tug. We made sure we had lots of fenders out to keep us off all the jagged bits. Eventually a guy jumps on board and we start filling out forms. It turns out he is a shipping agent who disappears with our passports and forms. He comes back after a while nd asks for 75 euros for his services. We eventually get him down to 70. Bit hard to negotiate when he has your passports. He takes the money – no receipt, no paperwork exchanged. Welcome to Albania! 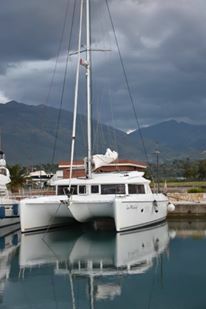 Then we head for the Orikum Marina, the only real marina in Albania. Its now getting dark so we charge over there, both engines running. We get there just on dark and tie up stern to. 14 euro a night is pretty good. /and the internet is not bad either. Other than that, its pretty quiet. Next morning, we are up early and on our way. We have to head back to Vlore to check out. We get close and call up the port captain who refuses us entry. Umm. We sy we will stand off waiting for authority and he eventually calls us onto the jetty, where upon our agent reappears and clears us out. This time we get some paper work. And we are off once more to Greece.